The diversity of life in the Earths oceans is astounding, despite the fact that we have explored less than 5 percent of its depths. Large animals like whales, dolphins and sharks might be what most people imagine when they think of creatures of the ocean, but photosynthetic algae may be the most important. Algae are the first step in a biological chain of events that make it possible for other life to exist, both in the oceans and on the land. Tidal pools along the Sea of Cortez provide a home to a diversity of both micro and macro algae species. The first law of thermodynamics states that energy can not be created or destroyed, only transferred from one state to another. Luckily for us humans (and all other heterotrophs), ancient organisms developed a process to turn the suns energy and a readily available element (Carbon) into useable biomass: Photosynthesis. This transfer of light energy into stored chemical energy (Carbon to Carbon bonds) allowed for the proliferation of animals that have inhabited the earth starting with the first fishes of the Paleozoic. 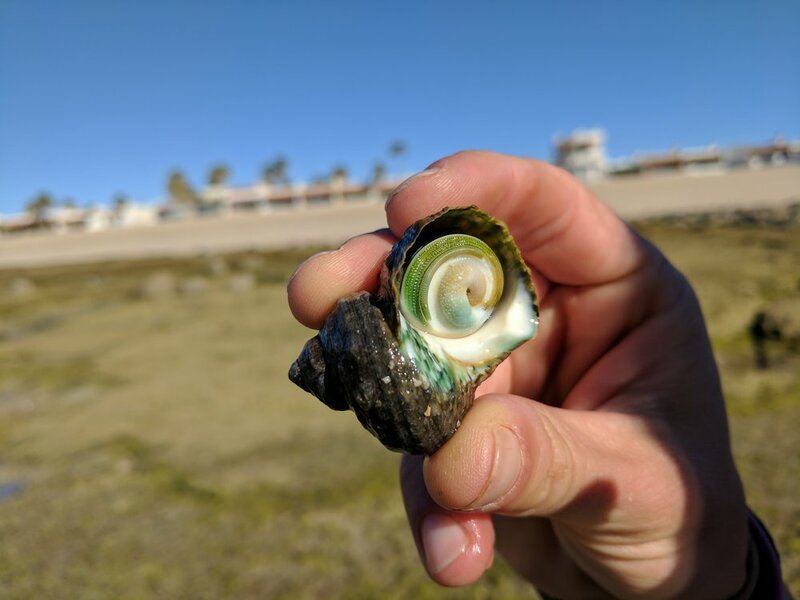 This marine snail has been feeding on benthic algae. The snail will likely become a food source for a larger fish. Ancient algae living in the oceans were very simple organisms similar to modern day cyanobacteria, a basic cell lacking the internal structure of organelle. Through time, as algal biodiversity increased so did the diversity of organisms that could feed upon them, setting up the base of a food web that has continued to this day. Imagine the simplicity of the first marine food web and how that has changed through time. The players have changed, but the rules are the same: get the energy and try to keep it. A fossilized stromatolite from Mexico. Stromatolites are ancient algae that have been mineralized. Algae play an important role in not just local and regional food webs, but in important global cycles like the Carbon and Nitrogen cycles. Without algae (perhaps even specific species of them!) the oceans of the Earth would not contain the diversity of life that they do. And to take that a step further, the entire planet would not contain the diversity that it does.